Tattoos are meant to be permanent deposits of ink on your skin tissue and can go deep into the layers of your skin. Till recently, having tattoos removed from your body was a painful process that left scars, and offered no guarantee of success. 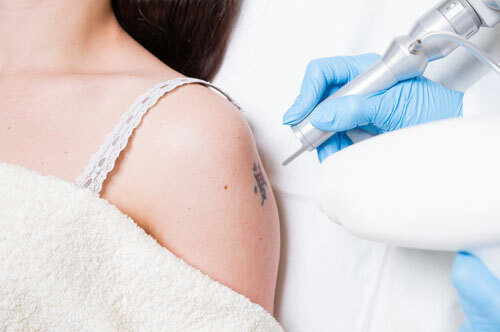 However, RevLite, an advanced Laser Technology used in various cosmetic treatments offers hope for tattoo removal as well. RevLite is based on PhotoAcoustic Technology Process or PTP that uses Q-switched Nd:YAG lasers to penetrate deep into the skin. Lasers of different wavelengths are used to remove different colours. Previous forms of tattoo removal using laser harnessed only two wavelengths to remove all the colours, with varying levels of success. But RevLite uses four wavelengths and these are very effective in removing blue, black, red, purple and orange colours in a few sessions and the more difficult to remove green and sky-blue colours in 10 to 15 sessions. A qualified and experienced medical practitioner will administer these laser beams on the tattoo spot. The laser energy reverberates through your skin breaking up the tattoo ink into fine microparticles that are then flushed out of your lymphatic system. A temporary whitening of the skin may occur following the treatment. There is no major discomfort. Patients report a light sting similar to that of a snapping rubber band, and a warm sensation in the tattoo area. The procedure is non-surgical, does not require anaesthesia and there are no side effects. Depending on the size of, and colours used in the tattoo, four to five sessions may be adequate to remove all the colours while green and sky-blue patterns may require 10 to 15 sittings.